In September of 1987, Jennifer (Morrison) Stainton was hit by a ½-ton truck on the highway outside her house. After a trip to the Glace Bay and Sydney hospitals, she was taken by ambulance to the IWK hospital where she was unconscious for just under 48 hours. Once she regained consciousness, she was taken into surgery where they put a pin in her fractured femur, set her up in traction and confined her to a bed for three weeks in the neurological ward. At the time, Jennifer was 3 years old. Although Jennifer's memories of this time are naturally a bit hazy, the memories of her concerned parents have remained very clear indeed. Fran Morrison (Jennifers Mother) was kind enough to share her experiences surrounding this extended stay at the IWK. "This was a very traumatic time for myself and Bill as parents, watching a 3-1/2-year-old lie so still and unresponsive in the bed. The IWK was the best place she could have been. The staff was absolutely incredible. They put a recliner in the room and my husband, and I took turns resting. Once Jennifer was in traction, they set up a cot in the room for me because I stayed there with her and Bill returned to Cape Breton to work. The doctors came in every day to see her, and there were always nurses in and out to see to her needs. The doctors also made sure I was doing okay. They told me that I was to get out of the building for at least 2 hours a day to go for a walk and clear my head for my well-being; they made it quite clear that if I didn’t do that, I would not be permitted to stay. So I made sure I followed their rules. And they were right; it helped to get out for a bit. I also spent time downstairs in the cafeteria at suppertime where I met the same people every day, and we had some good chats and shared stories. Some of the stories were heartbreaking, and I was so thankful that Jennifer was on the mend. They would take Jennifer to the recreation room where they would do activities with her, and she had a television in her room to relieve the boredom when we weren’t reading, or she wasn’t playing with one of the many toys she accumulated from family and friends who came to visit her. She was released three weeks after her accident with a hip spica cast. The cast stayed on for six weeks, and we returned to the IWK to have it removed. I cannot say enough about the entire staff we came in contact with. From the cleaning staff to the neurologists – the people were incredible. And they are what makes the IWK such a special place!!!" Today Jennifer is a star member of the Portland Street Honda sales team. From now until July 31st, Jennifer, and the entire Portland Street Honda team will be participating in the "Portland Street Honda Race to 1000", a race to sell 1,000 vehicles in 120, with a portion of each sale going toward our goal of donating $50,000 to the IWK Foundation. 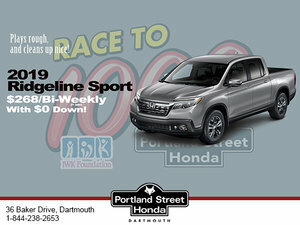 If you have a story about the IWK or would like to learn more about how you can help support our Race to 1000, please feel free to contact Portland Street Honda today!